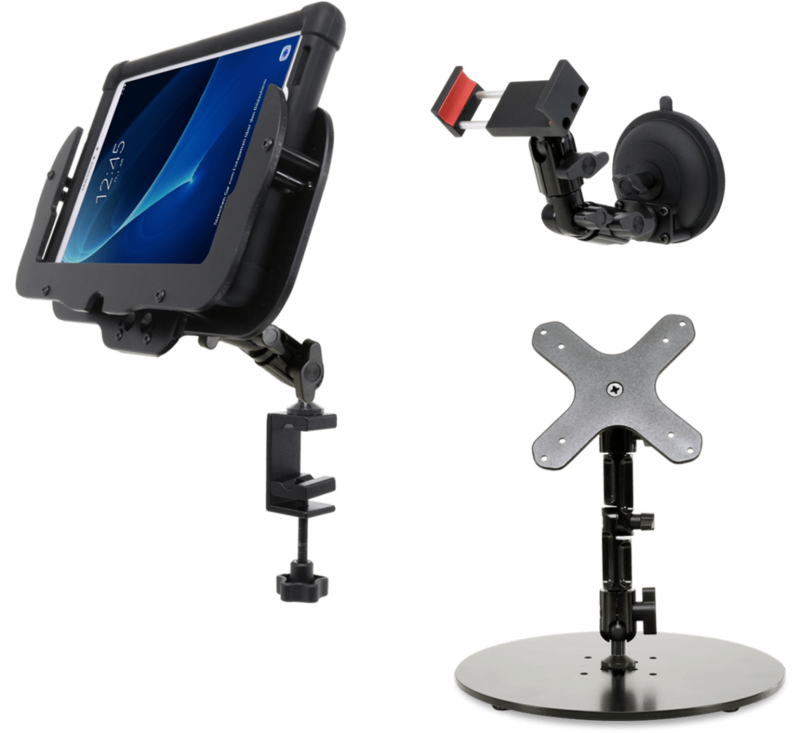 TabMount is a personnalized mounting system for your tablet. TabMount is suitable for any work environment and for any model of tablet. Create your perfect system mount ! The TabMount Concept : Place your tablet wherever you want ! TabMount is an adjustable fixing system for your tablet or your smartphone. The TabMount concept is made up of three components : the mount, the arm and the base. The base is the anchorage system element. We offer you three bases categories : bases just lay down, bases to screw directly on a surface and removable bases. To fit your tablet to the desired position, the arm is completely adjustable. Thanks to an extension system, the arm's length is totally flexible according to your need. The support is the element which holds your tablet or smartphone. Three kinds of supports are proposed : cradle, tablet holder or secured enclosure. Discover a large range of supports ready to hold your tablet or smartphone. Choose a cradle support for practicality or VESA enclosure for safety. The TabMount range offers two kinds of arms : The Basic Arm is an articulated arm infinitely adjustable thanks to an extension system. The iFlex arm can be guided in any directions while maintaining a remarquable stability. Click on the "set" button to design your fixing system adapted to your tablet or smartphone.